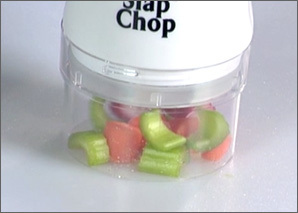 Dice, chop and mince in seconds with the Slap Chop! Just place the Slap Chop over the food and slap the plunger on top! The more you slap it, the finer the chopping gets. Chop fruits, vegetables, herbs, nuts, chocolate, and more. The three butterfly blades open for easy cleaning, and never need to be replaced. It is dishwasher safe as well. Slap Chop is Easy as 1, 2, 3! 1) Put your favorite ingredients under the Slap Chop. 2) Slap a couple times for a chopped salad. 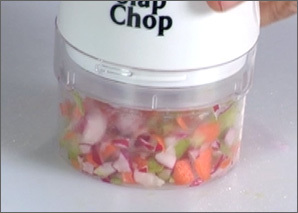 3) Slap even more for finely chopped toppings. You never need to switch blades. 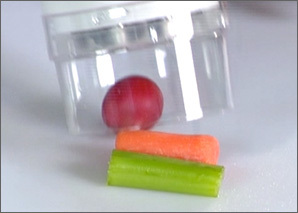 Chop up vegetables, nuts, & fruits, quickly and easily. With every slap, the finer the food gets. Easy to clean and dishwasher safe! I love this chopper! Bought a few for my family and they loved it as well! the best thing for chopping vegetables and etc.!!!! I'm satisfied. very well. thank you. Awesome item. Works as described.